Last February, we did a photo shoot with our mom cave and one of the first things the crew did when setting up was to ask for our wifi password. It was at that point that I had to sneak into the other room, crawl onto the floor, dig out the router from behind the couch, and scribble the key down on a piece of paper. Embarrassing! Like your friends and family? Want to be a good host? Many people have smart phones these days, help ’em out and have your network key (aka password) handy in a piece of artwork you can just point to. 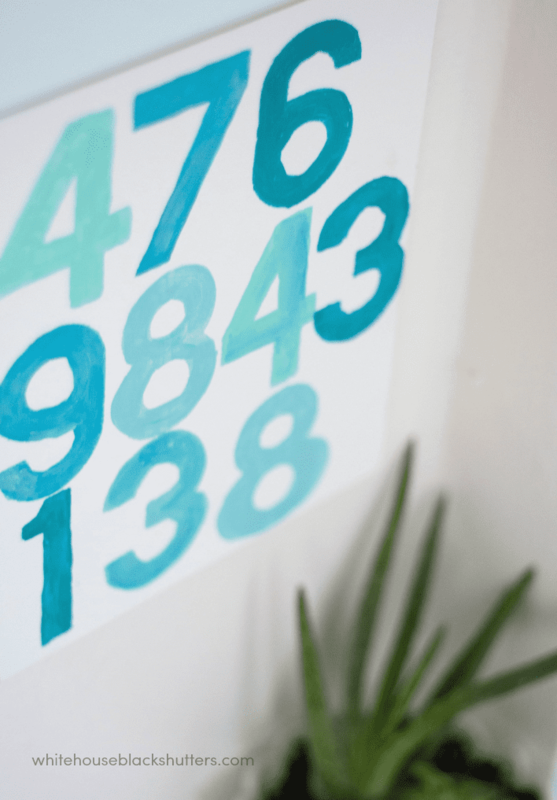 This was pretty darn simple and, if you have the supplies on hand, free. Get your wireless network password and practice writing it down in different ways/layouts, depending on what size board you have. 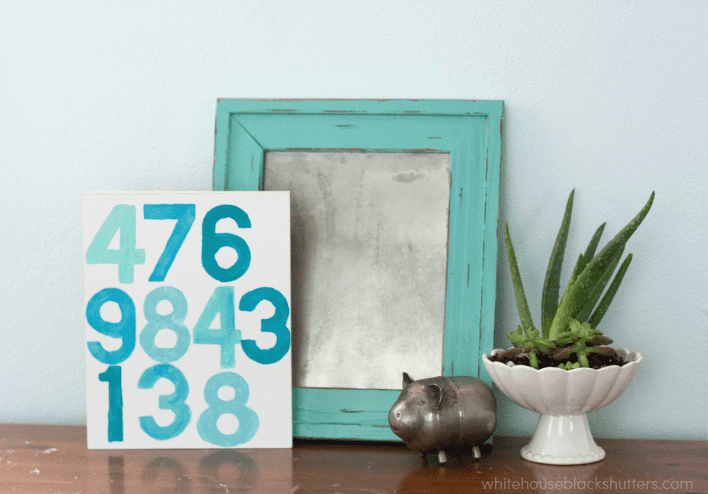 Arrange your stencils how you want ’em, and paint! And now I have a reminder close at hand to tell our guests “hey, if you want to jump on the wifi, there’s the password” and I can just point to the piece. What a great idea. I am always asking people what their wifi password is in their house. Everyone should have a piece of art with the password. Most people wouldn’t even know what it meant. Such a fun idea. No one visits me so I can’t use the idea unfortunately. I would love it if you would link this up to my link party going on now. Ha! Ours is my husband’s SSN with a few letters throughout. This is genius! What a terrible idea… or predominately so. This especially applies to the WEP password you are using. It isn’t secure and it isn’t securing your network, it does hassle your guests, so there is that. Is that a plus? Perhaps a line from your favorite poem. Frame that. You’ll have to explain that as much as the random string of characters AND it will be easier for you to remember and your guests to type. There are very few restrictions on a WPA2 password (when you set it, change the setting from WEP to WPA2, WEP is very limited in both length and content). Not sure how to do this? Call your internet service provider and ask them. They will walk you through the process and probably be glad that your are actually securing your network. Just remember the magic words are, “I want to change my wifi password and change it from WEP to WPA2”. I really love this! I actually have a left over board that I was going to write something on, but I didn’t know what. This might be it! I love this idea!!! I must make one for my guest room! 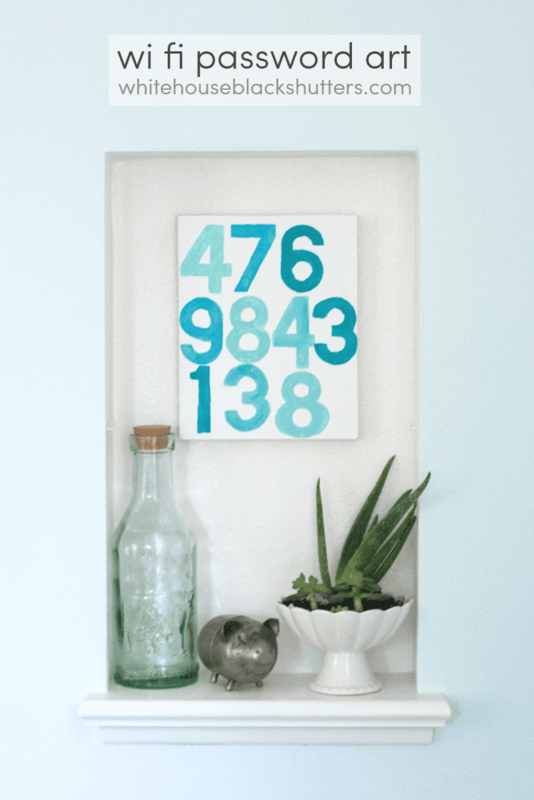 and I love the idea of adding it to the guest room! The last thing you do when heading to bed or relax for a second is come back out and ask for the password. Will add that to the post, thanks Katie! You are too cute! What a fun idea :). and you are too sweet 🙂 Thanks, Megan!